During Youth Week we held a Manga Character Design Workshop. 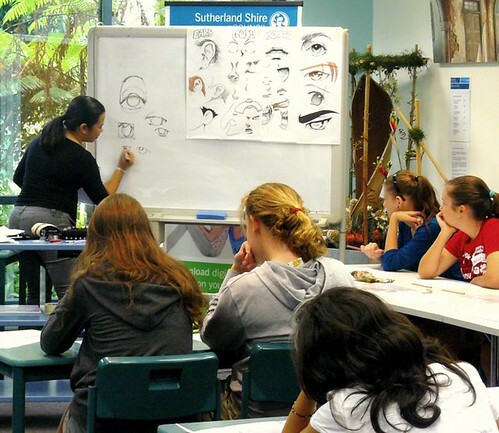 During the 2 1/2 hour workshop teens learnt how to design their own Manga character. By the end of the afternoon 29 characters were created and one was chosen as the best. The lucky winner was awarded with special Manga design paper kindly donated by Althea and Fiona the workshop trainers. Manga Workshop at Sutherland Library 3, originally uploaded by Sutherland Shire Libraries. Following hot on the heels of the Manga Workshop many kids joined us in the School Holidays for our Movie Madness activities. The staff dressed to the nines ready to walk the red carpet and many of the kids dressed as their favourite movie characters. They enjoyed playing the memory game, celebrity heads and making their own Hollywood Star.